A hot issue regarding an important change on appeal mechanism for IP cases has sparkled the IP circle in China. This change has been confirmed by the Standing Committee of National People’s Congress in October 26, 2018 and comes into effect on January 1, 2019. The details of this change are published in a Decision by the Supreme Court as follows. I. The Supreme Court has the jurisdiction over appeals of first instance judgements or rulings in IP civil lawsuits involving relatively strong technical background, including disputes on invention patent, utility model patent, new varieties of plants, layout design of integrated circuits, technical secret, computer software and anti-trust. II. The Supreme Court has jurisdiction over appeals of first instance judgments or rulings in IP administrative lawsuits involving relatively strong technical background, including disputes on patents, new varieties of plants, layout design of integrated circuits, technical secret, computer software and anti-trust. III. For retrial requests or Procuratorate’s protest against those effective first instance judgments, rulings or mediations in above mentioned lawsuits, the Supreme Court has the authority to apply trial supervision procedure, or otherwise designate lower courts, to hear such retrial requests or protests. IV. The Supreme Court shall report the implementation status of this Decision to the Standing Committee of National People’s Congress upon completion of the three-year term. V. This decision comes into effect on January 1, 2019. This important change is certain to reconstruct the legal practice for IP infringement and administrative cases, especially in patent field. Here are some takeaways to facilitate the further understanding of the background, benefits and even some concerns brought by such change. The establishment of unifying IP appeal mechanism at the national level has been promoted frequently in recent years. In November 11, 2017, the idea of “IP appeal mechanism at the national level” is accepted by the Central Reforming Committee and decided to be one of the key missions to be pushed forward in 2018. The Supreme Court is authorized to take the lead to formulate a detailed solution based on the extensive judicial experiences. After sufficient discussions and in-depth analysis over the years, the Supreme Court proposes the framework of establishing IP circuit court or tribunal inside the Supreme Court, which is accepted by high level administration. One of some other approaches has been in discussion among the IP lawyers in recent years, i.e., to establish a specialized IP high court to hear IP appeal cases nationwide. This idea is also reasonable since 3 specialized IP courts (Beijing, Shanghai and Guangzhou) and 16 specialized IP tribunals (Nanchang, Zhengzhou, Tianjin, Changsha, Xi'an, Hangzhou, Ningbo, Jinan, Qingdao, Fuzhou, Hefei, Shenzhen, Nanjing, Suzhou, Wuhan and Chengdu) have already been established and in good operation, therefore a specialized high court is rather suitable to supervise these courts and tribunals in terms of judicial procedures and construct a complete proceeding covering first instance and second instance. However, one of practical difficulties for such IP high court is that to establish a brand-new high court generally takes lots of resources. For example, long time is needed to formulate the acceptable authorized staffing from the chief judge of the court to the law clerks, which should sequentially also be strictly examined by the Standing Committee of National Congress. Such prolonged process may not solve the pressing issue of inconsistent standards on IP cases among local high courts currently hanging there in a good schedule. Moreover, for the time being, there are no high courts specialized in one certain field in the whole court system in China, which would also be a barrier for the high court in the specialized IP field, no precedent after all. In view of these circumstances, the framework of IP circuit court or tribunal inside the Supreme Court should be the most feasible solution. Since there are already six circuit courts under the Supreme Court, the establishment of the circuit court in IP field shall be much easier by referring to the system and experiences of these circuit courts. Moreover, the object of unifying standards in IP cases shall certainly be fulfilled by such appeal mechanism. One of the main objects of hearing IP appeal cases by the Supreme Court is to unify the standards to judge IP cases. In the current legal framework, the appeal of first instance judgment shall be heard by local high courts, for example, Beijing High Court is the appellate court for Beijing IP Court, and Shanghai High Court for Shanghai IP Court, Guangdong High Court for Guangzhou IP Court and Shenzhen IP Tribunal, Jiangsu High Court for Nanjing and Suzhou IP Tribunals. Therefore, it is possible that the judges in different courts do not have the same level of technical knowledge or not take the same standards when interpreting and applying the laws in complicated case circumstances, which possibly results in different judgments for almost the same case. When the appeal cases are heard by the Supreme Court, the same standards based on precedent cases shall be applied on same or similar cases and the issues caused by applying different standards shall be solved. Moreover, doing so shall also guarantee the quality of judgments since more and more experienced judges on specialized field will be working together to deeply analyze the legal issues and technical difficulties. This facilitates the enhancing of judicial credibility to strengthen the judicial protection on IP rights. Moreover, since the appeals of the infringement cases and the administrative cases are both heard by the Supreme Court, and possibly by the same judges, the protective scope of the invention and utility model patents will be determined and understood consistently. This is advantageous to the accused infringers since they do not need to transfer the opinions of the patentee from the administrative side to the infringement side and the judges would have good understanding on the patents, improving the efficiency of the whole legal proceedings. Another benefit of hearing the infringement appeal cases by the Supreme Court is to provide equal protection to both domestic and foreign companies and avoid potential local favoritism. This is especially favorable for right holders from foreign countries. The questioning or doubts on local courts will be disappearing and the foreign companies will have more confidence to enforce the IP right in China without the fear of local influences by giant companies. This is consistent with our national policy of “creating a good business environment” promoted by the government. Not all IP cases will be handled by the Supreme Court. Only some selected type of IP cases are “honored” to be heard by the Supreme Court on appeal at the second instance. The principle of selection is mainly based on the specialty, complexity and difficulty of the cases. Taking patent cases for example, for the infringement side, the judgments on invention patents and utility model patents shall be appealed to the Supreme Court, while the infringement on design patents shall still be heard by the local courts as the second instance since the design patent is believed not to cover difficult technical issues. However, for the administrative cases, the judgments to evaluate the validity of all three patent types, invention, utility model and design, shall be heard by the Supreme Court. That is to say, for the design patent, the infringement appeal shall be heard by the local high courts, while the administrative appeal on validity shall be heard by the Supreme Court. Other cases related to science background, including new varieties of plants, layout design of integrated circuits, technical secret, computer software and anti-trust, shall be heard by the Supreme Court no matter on civil infringement side or administrative side. One of the questions is how to apply the trial supervision procedure. As commonly known, the second instance before local high courts makes the final and effective judgment in China. The losing party has the right to file a retrial request before the Supreme Court, but this request is not automatically accepted by the Supreme Court. In the situation that the Supreme Court believes the original second instance judgment is good in legal issues and fact-finding, the retrial request shall be rejected. That is to say, the Supreme Court is authorized to supervise the judgment of the local high courts. Here comes the question: when the Supreme Court hears the cases on appeal at the second instance, which court is competent to supervise the Supreme Court? The preliminary answer would be that the retrial request should still be heard by the Supreme Court. But it is not the IP circuit court or tribunal itself to hear the retrial request. As explained by the Chief Judge ZHOU Qiang of the Supreme Court, the retrial request shall be heard by the Supreme Court IP Division, which has been established inside the Supreme Court for a long time as “the Third Civil Division” and bearing the burden of supervising all IP cases in China. Compared with newly established circuit court, the Supreme Court IP Division is rather mature and its level could be understood to be higher than the IP circuit court. Chief Judge ZHOU points out that the Supreme Court is drafting the detailed judicial interpretation to clarify the issues of case docketing, trial supervision, the operation of appeal rules and so on. This interpretation is sure to be another focus by IP circle. Under such framework, one concern might be raised, i.e. whether the retrial/supervision procedure might not be practically effective since it is just the Supreme Court to judge on both the appeal and the retrial/supervision after all. This may be left to be observed in the future. However, this might not cause big problems since at least the judges in the circuit court and the IP Division are not the same, and from another point of view, the opinions of the IP division may be better communicated with and understood by the IP circuit court, therefore the efficiency and quality of IP circuit court would be improved and probably the future reversal rate for retrial would be low. As indicated in the 2017 Supreme Court IP Cases Annual Report, 796 retrial requests have been filed in 2017. This is just the number of retrial requests, behind which there are more than a thousand second instance judgments. Therefore, it can be imagined that in 2019 thousands of second instance appeal will be filed before the Supreme Court. Whether there would be enough judges in the Supreme Court to handle these cases is a big problem. It is possible that the Supreme Court will recruit some judges from the local high courts temporarily. But in the long run, new judges will be hired to guarantee the smooth operation under large quantities of cases. In summary, unifying the appellate courts for certain patent cases is a big step for better patent protective system. 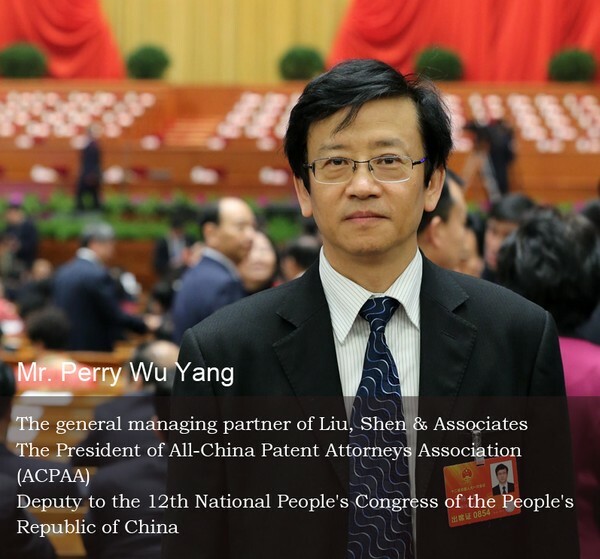 Mr. Perry Wu YANG, the general managing partner of Liu, Shen & Associates and president of All China Patent Attorney Association, has promoted the unifying appellate IP courts for years and he filed such bills when he was in his capacity as the Deputy to the 12th National People's Congress. More detailed implementing rules are expected to ensure this new mechanism to be in the right track. We will keep a close eye on the development and provide the analysis as it arises.